The causes of the problem in our homeland's educational system are many, most significant being: lack of resources -less available money mainly due to mis-allocation of funds and corruption, which in turn lead to lack of good books, ineffective teachers, poor facilities (not conducive to learning), inadequate school supplies to facilitate teaching, etc. And add the fact that many school kids are hungry. We know an empty stomach in school does not aid learning. Why don't we have enough funding for public schools? There is no honest desire on the part of the government officials to provide more funding to improve the public school system (PSS). The PSS is not anymore a national priority from the time of the Marcos Dictatorship, whereby the decline and deterioration started. In addition, the Dictatorship needed the military and made sure the military gets more and more of the budget pie. This practice has continued till today and will in the foreseeable future, with succeeding governments and politicians who are mostly self-serving and traitorous to the present and future generations of our native Filipinos. And corruption in the PSS continues unchecked and thus makes things worse. Marcos' successors brought precipitous decline in the educational quality because of their prioritizing the payment of odious foreign debts which have compounded each subsequent year. These so-called leaders would rather have the native populace suffer the adverse consequences of the Structural Adjustment Programs(SAP) imposed by the (IMF/WB) on the common good. Rather than capitalizing on the global popularity of the so-called EDSA "Revolution" (1986) by using such as leverage to request payment moratorium from and/or refusing payment of the odious debts, the naive and incompetent Cory Aquino first kowtowed to foreigners instead and promised to pay religiously as before even if doing so deprives the impoverished populace of the immediate and necessary social programs, including education, health care, improved infrastructure and other public services. (despite her supposed and publicized religiosity). As to the present goals of the educational system: during the Dictatorship, Marcos followed the dictates and plans of the IMF/WB as to the direction of our PSS and educational system as a whole; that is, to provide cheap labor to Multinational/Transnational/Global corporations. But now, the IMF/WB plan itself is messed up by the fact that by joining the WTO in 1995, thanks to the Fidel Ramos/GMA tandem, most manufacturing transnationals have shut down and/or moved out of the country to go to China and other lower waged countries, such is the logic of business/capitalism of maximizing profits. Thus we are faced with graduates, regardless of whether deserving or not, with much less available jobs in their chosen professions/studies. In reality,there were few professional/non-professional jobs to begin with even during pre-martial law times, given the absence of significant industrialization. Furthermore, despite the fact that ours is considered an agricultural economy with a greater part of the labor force in it, even graduates of agricultural schools do not have much job opportunities since there are only a few companies, e.g. San Miguel, which are into agribusiness. Large landowners, who mostly are not entrepreneurs, do not go into nor want to invest in agribusiness and industrial manufacturing and are actually part of the sociological obstacles to economic progress as these belong to the aristocratic elite, who are mainly a risk-averse class and thus indulge in rent-capitalism..
Nowadays, mere survival has become the paramount issue for most students, graduates and families -giving credence to Maslow's Theory on the ”Hierarchy of Needs” (or for the most part simple common sense). Thus the schooled individual, not necessarily "educated", gets/takes a job -better chances if connected- regardless of whether he/she is thus underemployed, grabs any menial job abroad, swallowing all his pride at best and sacrificing his dignity at worst, and leaving family and love ones. Why do the government and politicians enthusiastically support the export of OFWs? To pay for our odious foreign debt, to not plan for the common good, to have more money to steal and to have a safety-relief valve that would delay/prevent a real revolution due to rising expectations, the government and politicians have thus encouraged and begged other countries to allow our primary export earner -the OFWs- to come to their countries, of course trading off our national patrimony and sovereignty; as beggars are not choosers. Where poverty and impoverishment are the norm, gambling and alcoholic drinks seem to provide the unfortunate: the source of income they can not earn through productive and creative work; and the escape from realities for the moment. While I was at SMC's Corporate Planning Department, my bright economist-colleagues demonstrated this correlation for beer-sales forecasting. As how to change the educational system, I say it is naivete at best, ignorance at worst to even hope for reform. As in other national or local issues in the homeland, the people who wield influence and power, the ruling elite: aristocrats, politicians, businessmen, military brass, foreign investors, many wealthy resident/naturalized aliens, do not care. Only a nationalist revolution can make fundamental changes. 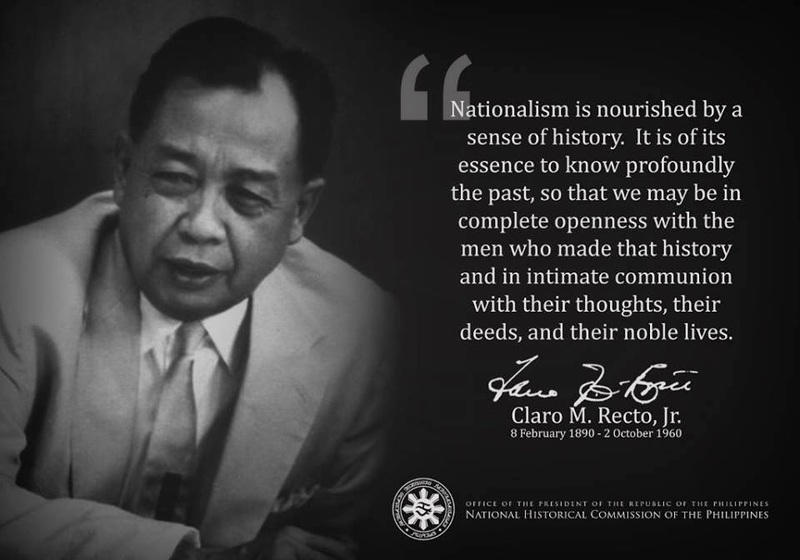 Only a revolution with the support of an informed, nationalistic coalition of the native Filipinos can offer possibilities for such changes and without falling prey to insincere leadership (as we have learned much from many of our ilustrados then and now so-called educated in the history of our people) that will rise out of the struggle. Whether the dwindling, native educated middle class can work with the impoverished native majority is the big question. All the above may sound rhetorical but that is where a deeper and serious analysis will ultimately lead a concerned one to conclude. To not do so, to see only the trees and not the forest, to scratch the itch and not remove the cancer, to treat the symptoms and not the disease, is not to address and uproot the real causes of the people's predicament. To still believe and work in the present political-economic system to reform itself is like exercising freedom within a caged Filipino mind. Below essay from the alternative/progressive press BULATLAT discusses the most recent government plans for our educational system. “What the government should prioritize are the shortages in the basic education system like classrooms, books, chairs and teachers,” France Castro, secretary-general of Alliance of Concerned Teachers said. Even DepEd’s data shows that there are thousands of shortages of chairs, classrooms, books, and most importantly teachers. The mandatory kindergarten made the 152,569 shortages in classrooms more pronounced. Worse are the shortages in teachers. Currently, there is a shortage of 103,599 teachers. ACT calls the implementation of universal kindergarten a disaster because in schools such as the Corazon Aquino Elementary School in Batasan, Quezon City, the five-year old pupils lacked chairs to sit on and were cramped in the few classrooms made available . Castro said ACT also wants Filipino children to have quality education. But she finds no reason to be optimistic because of the perennial shortages. “They [Dep Ed officials] won’t listen anymore. It’s like they’re deaf,” Castro said disappointed. Castro said a summit was held last Dec. 12 on the K to12 curriculum attended by DepEd officials and public school teachers. She said they raised the problem of shortages as an obstacle to the orderly implementation of the K to12 basic education program but to no avail. According to ACT, the implementation of Kindergarten was not included in the 2011 budget of P207 billion ($4.7 billion). Because the program was not made into law, according to ACT, there was no allocation for its implementation. And because there was no fund allocation, instead of hiring regular teachers, the DepEd hired volunteer teachers who they paid a meager P3,000 ($69.76) per class. To address the shortage of classrooms, pupils were put in whatever space was available in elementary schools. In DepEd order No. 37, libraries, science laboratories, home economics buildings, resource centers and other available spaces were identified for use of kindergarten classes. According to Salinlahi Alliance for Children’s Concerns, there should be one chair per pupil, one comfort room per classroom since the children are not yet toilet trained and one teacher for a maximum of 25 pupils. “These are the prerequisites of a Kindergarten program. But since there is no budget for this program this is not happening in many elementary schools in the country obviously because, first and foremost, the DepEd did not really prepare for this program,” said Melissa San Miguel, spokeswoman of Salinlahi. Government’s neglect of social services like education is reflected in the budget. Though DepEd had the biggest allocation for 2012, the P234 billion ($5.3 billion) budget is still insufficient to address the shortages. Under the Aquino administration, the budget of DepEd was increased. From P175 billion ($4 million) in 2010, Aquino increased the budget to P207 billion this year. “For 2011, it is a welcome development that there was a slight increase in the budget for basic education. Yet, despite this increase, it is crucial to note that the increase remains grossly insufficient in addressing the needs of basic education,” Kabataan Party-list Rep. Raymund Palatino said. The following table shows the shortages and the plans of the Aquino administration to address the shortages. Suzzana De Jesus, principal of Demetrio Tuazon Elementary School admitted that not everything in public schools is for free. “Since what we need here in school like books and other learning materials are not provided to us ahead of time we really have to sell these in order to provide the students their books,” De Jesus said in an interview with Bulatlat.com. Even as the DepEd announced time and again that no fees would be charged to students, the insufficient budget allocation forced teachers to sell not only learning materials but also pad papers, pencils, even snacks. Because of poverty, many students are forced to dropout from school. In 2008, for every 100 pupils who enter grade one, only 66 finish grade six; for every 58 students who enroll in first year high school, only 23 enter college and only 14 graduate. In an interview with Bulatlat.com, Castro said there are still gray areas in the K to12 program. “A massive retooling and retraining of teachers will be needed in order to teach students in senior high school,” Castro pointed out. She added that the training of teachers would require a substantial budget. However there is no identified budget for it. There is also a drastic change in the curriculums of Math and Science in the K to12 program, said Castro. A spiral curriculum will be used in implementing the K to12 program. Under the spiral curriculum, according to the Education.com website  students repeat the study of a subject at different grade levels, each time at a higher level of difficulty and in greater depth. Chopsuey is a Chinese cuisine in which different kinds of vegetables are mixed together. In the implementation of K to12, one subject like Science for example will be divided into four classifications/specializations for the whole school year. In this method, according to Castro, more than one teacher will tackle one subject like Science. DepEd said there would be team teaching. “For example, in Science, one teacher who specialize in general science will teach it during the first grading period, A teacher who specializes in biology will teach during the second grading period, and a teacher specializing in chemistry will teach during the third grading period,” Castro explained. She also added that there is still no final curriculum that they will use for the implementation of the K to12 program. Castro said the DepEd and Tesda presented different curriculums during the Dec. 12 summit. The Commission on Higher Education (CHED) said they are still not ready. The DepEd, Tesda and CHED are the lead agencies that will ensure the smooth transition from the existing 10 year education cycle to the K to 12 basic education cycle. In his privilege speech delivered in Congress, Kabataan Party-list Rep. Raymond Palatino said, “I very much understand that added learning and training period in elementary and high school could be beneficial for our youth. The K to 12 proposal, however, is rendered problematic by the context within which it is set to be implemented and the direction it intends to take,” Palatino said. Palatino pointed out that the length of school-cycle has nothing to do with the quality of education. Citing the study entitled “Length of school cycle and ‘quality’ of education”, Palatino said, educators Abraham Felipe and Carolina Porio found out that “there is no correlation between the length of school cycle and the quality of education.” By using TIMSS as basis of the study, Palatino said the findings underscore that some countries with the same school-cycle as the Philippines have high scores; other countries with longer cycles than the Philippines have lower scores. Even DepEd Sec. Armin Luistro said the K to12 program would not solve the existing problems of the country like unemployment. “He said in the summit that K to12 will not assure the students that they will have jobs after their six years in high school. It came from his mouth that K to12 is just an attempt to help solve the problem of education but it is not the solution,” said Castro. It's not always funding issue. Filipinos should think of practically. Let's copy what the chinese had done. They dont have funds, no money when Mao Tse Tung came into power so they try to centralize the materials. Instead of various book authors they made one common book. Let's just use one best book instead of buying different authors of the same subject. Now the chinese are good in chemistry, math, physics, engineering, medicine, etc. Non-standard textbook only feeds the revenues of foreign authors. Too much waste. I hope you read the whole article as I did not see you provide any basis for your claims regarding funding "not always an issue" in the homeland. I also happen to know teachers in the homeland, some of whom are friends and relatives, who consistently allude to such lack of resources for years to now. About Mao's China. I would be interested in seeing your basis/proof for similar statements. I have worked with mainland Chinese chemical engineers since 1990 and I did not hear claims from or see them using "one book." I have seen them carry/use illegal copies of American engineering textbooks. Even in my youth (1960s) I have owned and read at least 5-7 books published from then isolated mainland China. I have been a chemistry teacher at Don Bosco Technical College in Mandaluyong and I know there are good and badly written books. That's why one has to selectively read other books by other authors. Also, what is "non-standard" (or standard) book to you? There are a variety of subjects for books and some subjects I don not have time or interest to read. But bottomline to me, reading books is never a waste of time, money or effort. Lastly, you're not talking of the bible like the evangelicals, are you?